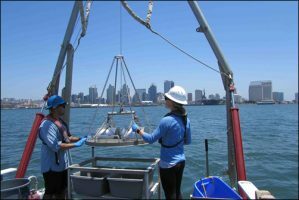 Participants of the Southern California Bight 2018 Regional Monitoring Program’s Sediment Quality element have finished collecting seafloor sediment samples from about 400 sites across the Southern California Bight. The field sampling, completed in September, paves the way for participants to begin evaluating the Bight’s chemical, toxicological and biological health. Additional Bight ’18 analyses will focus on screening sediment samples for contaminants of emerging concern using bioanalytical cell assays, and quantifying levels of the algal toxin domoic acid in sediment. As part of field sampling, trawl nets were used at more than 130 sites to sample fish, large invertebrates and trash found along the Bight seafloor. Participants also have been collecting sportfish from across the Bight to look for chemical contaminants known to bioaccumulate in Southern California marine food webs. A total of 49 environmental organizations are participating in the Bight ’18 Sediment Quality element, which is targeting 11 distinct Bight coastal habitats across more than 1,500 square miles of Bight coastal waters.